Marlane Fuhrmann is 19, and finally acting her age. There was the teen drama of buying a prom dress then breaking up with her boyfriend, getting her grades up to more A’s than her mostly B’s and C’s, and making plans to go away to college in the fall. It wasn’t long ago that Marlane was acting like an adult—a mother, actually, to her little sister—a role she played since she was 7 years old. Marlane’s life story is incredibly sad, starting even before she was born. When her birth mother was pregnant with Marlane and in her third trimester, she was in a car accident that caused damage to her unborn daughter’s eyes. Marlane was born with nystagmus, a vision condition characterized by involuntary eye movement that often results in reduced vision. Her eyes jump around, often in different directions, making it difficult to focus on objects. She wore glasses as a toddler and had surgery at age 4 to correct her “sideways” vision. She had to turn her head sideways in order to see straight. The surgery worked, but by the time she was 10 her vision worsened. To make a sad, long story short: Marlane and her little sister are now with a foster mother, and she relies heavily on her strong faith. 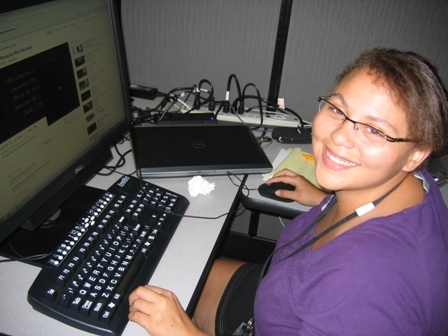 Marlane spent a week this summer at Blind & Vision Rehabilitation Services of Pittsburgh in the Access Technology program, learning Internet research, word processing, basic Windows® concepts, among other technologies. She said her training at BVRS has helped her be more specific in conducting Internet searches, has given her a better understanding of programs like ZoomText, which enlarges the entire computer screen, and has taught her how to customize the computer screen. Marlane proved to be an excellent student, according to BVRS staff, considering she never received special accommodations in school until she was a senior this past year. Her foster mother made sure she was examined by a specialist who has dealt with many cases of nystagmus. And she now wears contact lenses and has hopes of maybe one day getting a driver’s license — limited to daytime driving. Marlane attends the University of Pittsburgh Greensburg campus, majoring in psychology. She hopes to be a social worker.